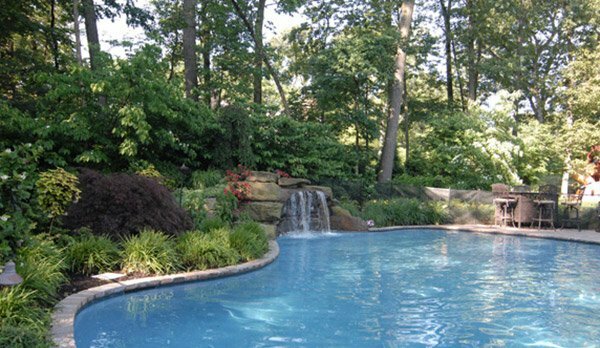 Pool landscape is very important in redesigning our backyard. This adds more beauty to the area and surrounding. Although there are lots of people who find it very difficult and a challenging task. Many homeowners claim that they don’t have enough skills and talents to make a great landscape. So there are homeowners that consult landscape designers to redesign their backyard. Since swimming pools give a relaxing effect to the members of the family, it is considered to be one of the best place for the family where they can get together and spend quality time during holidays and even weekends. This also make the house exterior elegant and luxurious. So we have collected different images of the designed landscape of the known designers. 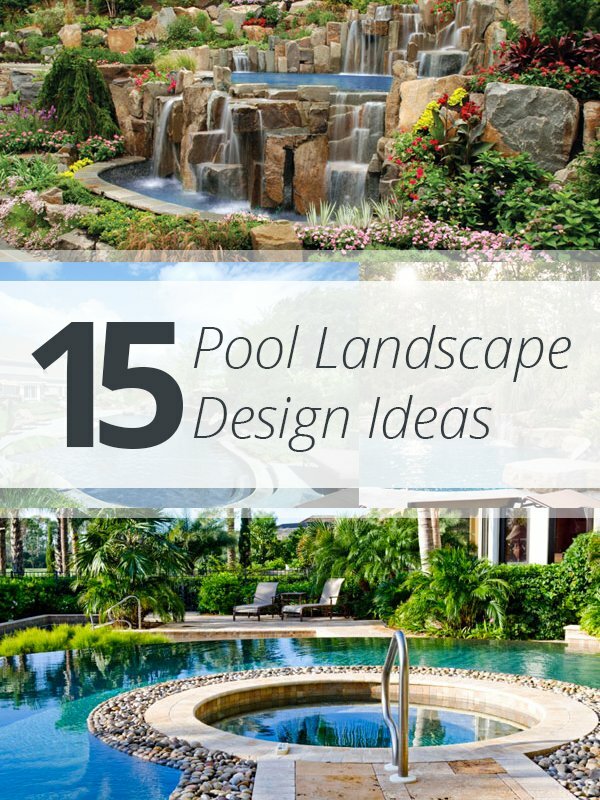 Why don’t you scroll down the page and be inspired to use one of these pool landscape designs ideas from the designers below. 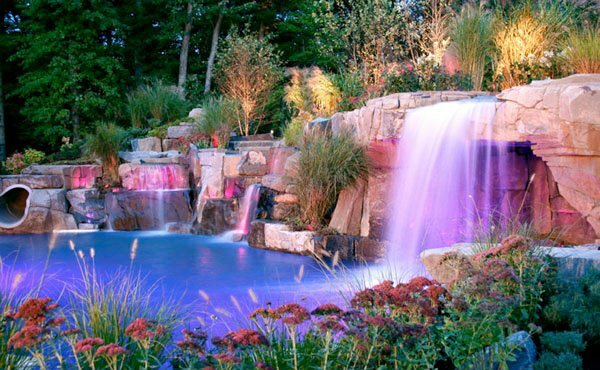 Here is an enchanted effect of the lightings and water fountain in this elegant pool landscape. Green plants not only make this exterior close to nature but assure the homeowner to enjoy the ambiance. 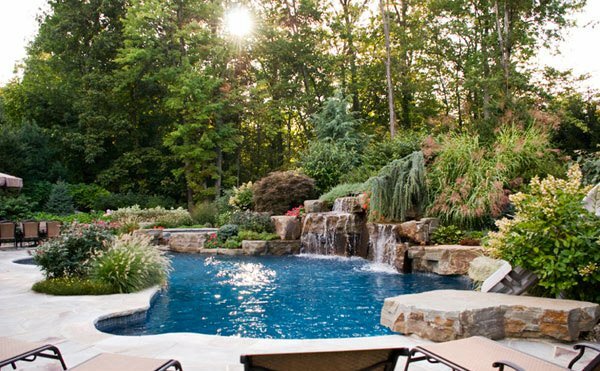 The sound of the flowing water of this swimming pool together with the plants that surrounded it maintains the serenity of this backyard. 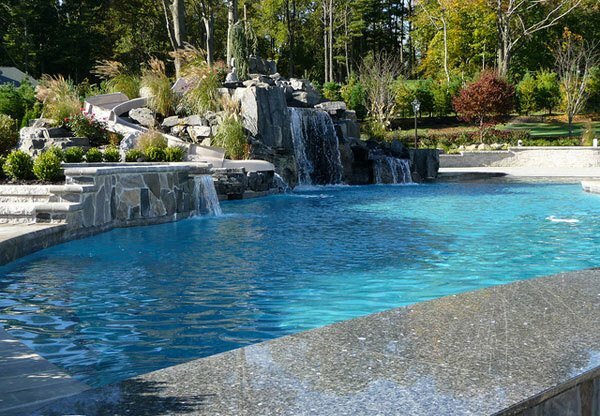 Tall trees, huge stones and great maintenance of the plants in this pool side highlighted the freshness of the water in the pool. Thumbs up for the designer who have made an artistic job well done. 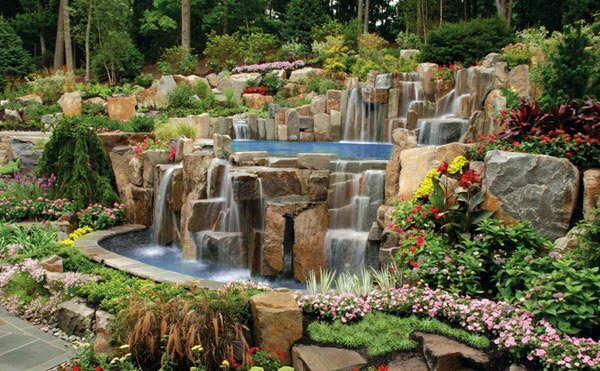 This kind of landscape design is also well-suited for a resort or a homeowner who dream of a tropical theme backyard. The blue sky and the green plants surrounded this area is one of the best spot in the house. 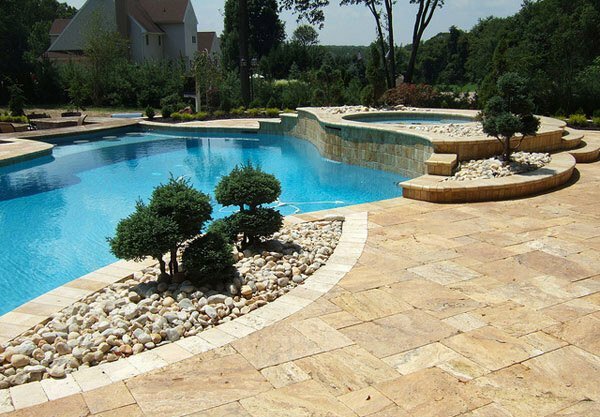 Bonsai plants with the limestone are best suited for the beige color tiles in the pool side. 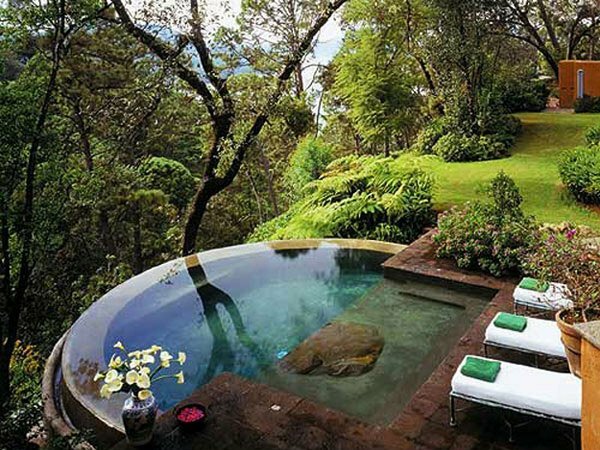 Jacuzzi, bench and spa enhance the look of the pool as well as the tall trees surrounded it. For a small backyard like this, the unique shape of this pool together with the bench and the panoramic view is enough to achieve the stress free area. The free shape pool as well as the plants and flowers design here displays a natural theme. This pool landscape seems like a river in the middle of the forest. The coolness of the water is obviously seen here because of the huge stone and green tiles used for the pools. 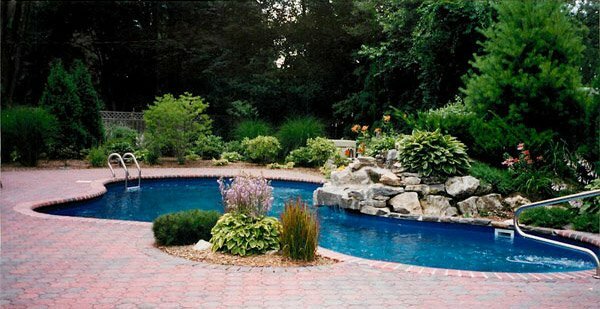 Different bright colors of the flowers and water falls in the side of the pool adds beauty to this outdoor scene. You may consider that the designers just apply a simple landscape design in this section but this is enough to prove that this area is a stress free place. They are all definitely enchanting! Such lovely designs. Those designs would probably cost a fortune but it would totally add a visual appeal and it will absolutely be an envy among friends and neighbors. 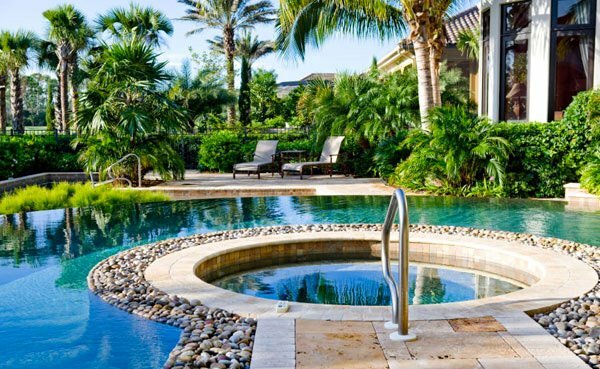 I really find these pool landscape design ideas so cool. These are indeed so inspiring. Landscaping is all about adding beauty to one’s home and creativity to one’s location. This adds incredible scenery to the environment that soothes the senses and pleasure to visitors. Thanks for sharing all these wonderful thoughts.